Augmented reality, or the blending of the real world with computer graphics on the fly, is one of the most exciting fields in tech right now. Unfortunately, there haven’t been many practical uses of the technology — we’ve seen some very impressive video game peripherals and a few Terminator-style phone overlays from companies like Layar, Sekai Camera, and Seer Android, but these still have a ways to go before they’ll hit the mainstream. Zugara, an interactive marketing agency, has built something a bit more practical for the time being. It’s put together the Webcam Social Shopper, offering a way to help you try on clothes online from the comfort of your bedroom. At least, it lets you overlay a static image on top of your body and pretend you’re wearing it. Which is sort of a start. From a technological standpoint, the application is pretty cool. While other similar clothing applications require you to upload a static image of yourself, the Zugara app uses your web cam, detecting where you’re standing in a room and adjusting the position of the overlain clothing appropriately. Even better: instead of having to return to your keyboard and mouse to try on a new outfit, you can simply move your arms above your head to navigate through the various clothing options (be sure to watch the video to see how it works). Now, it’s pretty obvious that this isn’t going to be particularly useful for figuring out how any item of clothing is actually going to look on you. 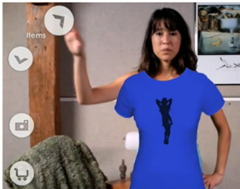 The clothes are basically just images being pasted on top of your body, without any attention being paid to your proportions (it would be much more useful if the app could generate a 3D model of your body and adjust the clothing fit accordingly). On the other hand, it could be handy for figuring out which clothes might look good together. Clashing colors and patterns may be incredibly obvious to the well-trained eye of a veteran shopper, but for some people (read: me), a virtual fitting room could prove useful. Zugara is also trying to weave a social element into the application, offering examples of sharing outfit choices over Facebook or allowing friends to help choose outfits in real time, which could turn out to be the app’s real strength. At this point Zugara is describing this as an Alpha app — it hasn’t yet been integrated with any stores or brand sites, so you can’t try it out for yourself. But it won’t be surprising if we start seeing similar technology popping up at online stores soon. Even if it doesn’t work all that well for actually trying on clothes, the social component and novelty factor could make it appealing to stores anyway. -As you will see in the blog post below. Future executions will allow for a user to enter their measurements and get a “fitted” image. Sizing though, tends to be specific to the retailer/brand and will need to be “tailored” (i.e. integrated) accordingly.